Boeing executives offer a simple explanation of why the company's best-selling aircraft in the world, 737 MAX 8, crashed twice in recent months and left Jakarta, Indonesia in October and then Addis Ababa, Ethiopia in March. Executives claimed Wednesday, March 27, that the cause was a software problem – and that a new software upgrade fixed it. But this open and closed edition of events is in conflict with what diligent airline journalists have uncovered in the weeks since Asia, Europe, Canada and then the United States anchored aircraft. 1; with an under-resourced Federal Aviation Administration (FAA) apparently all too keen on Helping a US company be threatened by a foreign competitor rather than asking tough questions about the project. The specification of what happened in the regulatory system is still in progress (and despite the managers' assurances, we do not even know exactly what happened on the flights yet). But the big picture emerges: A large employer faces a major economic threat, and short-term policy and greed gained beyond the integrity of regulation. It's a scandal. There are many different passenger aircraft on the market, but only two very similar narrow body plans dominate domestic (or intra-European) journeys. One is the European company Airbus 320 family, with models called A318, A319, A320 or A321 depending on how long the aircraft is. These four variants have in the design the same flight deck so that pilots can be trained to fly them around each other. The 320 family competes with a group of aircraft called Boeing 737 – a 737-600, a 737-700, a 737-800 and a 737-900 – with higher numbers indicating larger planes. Some of them are also extended models that have an ER connection to the name, and you might guess they have longer intervals. It is important that, although there are many different flavors at 737, they are somehow the same plane, as all the different 320 family plans are the same plan. For example, Southwest Airlines simplifies its overall operation by flying only 737 variants. Both the 737 and the 320 come in many different tastes, so the airlines have plenty of options as to what type of aircraft will fly exactly which route. But because there are only two players in this market and because their offerings are so fundamentally similar, the competition for this part of the airline market is both intense and strangely limited. If a company had a clear technical advantage over the other, it would be a minor disaster for the losing company. And that's what Boeing thought it was facing. Jet fuel is a great price for airlines. With wage costs largely driven by collective bargaining and regulations requiring minimum levels of Aid per flight. Passengers, fuel is the cost center that has the most capacity to do something about. Therefore, improved fuel efficiency has emerged as one of the main reasons for competition between aircraft manufacturers. If you roll back to 2010, it seemed as if Boeing had a real problem in this regard. Airbus came out with an updated version of the A320 family, as it called the A320neo with "neo", which means "new engine option." The new engines should be a more fuel-saving design with larger diameter than previous A320 engines, which could nevertheless be mounted on what was largely the same aircraft. This was an inappropriate engineering business both in the design of the new engines and in finding out how to get them to work with the old aircraft, but even though it cost a lot of money, it worked basically. And it raised the question of whether Boeing would answer. One of the problems for Boeing is that it requires more Work to put new engines at 737 than on the A320. The 737 is lower to the ground than the A320, and the new engines have a larger diameter. So while both manufacturers were going to work, Boeing guys would have more work to do to jack up the plane. It will cost more while reducing commonality with the current fleet. As we know from last week, reduced commonality also means higher costs for airlines. Under the circumstances, Boeing's best opportunity was to just take the frame for a couple of years and accept that it should start selling 737's at a discounted price while taking time to design a brand new aircraft. It would, of course, be time consuming and expensive, and in the meantime they would probably lose a bunch of narrowband sales to Airbus. The original version of 737 flew first in 1967, and a decade-old decision on how much height to leave between wing and runway, left them boxed-out of 21st century engine technology – and there was simply nothing to Be done about it. As recently as February 2011, Boeing's president and CEO James McNerney held the plan to design a brand new aircraft. "We're not finished evaluating this whole situation yet," he told an analyst call ", but our current bias is moving to a newer aircraft, a brand new aircraft at the end of the decade, beginning of The next decade. Our assessment is that our customers will wait for us. " But in August 2011, Boeing announced it had ordered orders for 496 new Boeing 737 aircraft from five different airlines. It's not quite clear what happened, but reading between the lines seems that Boeing came to the conclusion that air carriers would not wait for them to talk to their customers. A certain critical mass of airlines (American Airlines seems to have been particularly influential) was credible enough in its threat of switching to Airbus equipment, as Boeing decided it was necessary to offer 737 buyers a Boeing solution faster than later. Commit to putting a new engine that doesn't fit on the plane was the corporate version of the Fyre Festival's "let's just do it and be legends, one" moment, and it's not surprisingly settled, leading to a difficult technique and regulatory problems. As the industry trade publication Leeham News and Analysis explained earlier in March, Boeing engineers had been working on the concept, which became their 737 MAX, even back when the company's plan was still not building it. In an interview in March 2011 with Aircraft Technology, Mike Bair said, as the leader of 737 product development, that reengineeing was possible. "There has been quite a lot of engineering work on it," he said. "We found out a way to get a big enough engine under the wing." The problem is that an aircraft is a large and complicated network of interconnected parts. To get the engine under the 737 wing, engineers had to mount the landing gear higher and more forward on the aircraft. But moving the landing gear changed the aircraft's aerodynamics so that the aircraft did not handle properly at a high angle of attack. This in turn led to the creation of the Maneuvering Characteristics Augmentation System (MCAS). It set the angle of attack in most situations, but it created new problems in other situations, as it made it difficult for pilots to control the aircraft directly without being overridden by MCAS. On Wednesday, Boeing exclaimed a software patch that says corrects the problem and hopes to persuade the FAA to agree. But note that the underlying problem is not really software, it is with an effort to use software to bypass a wide variety of other problems. 1of x: BEST analysis of what really happens on # Boeing737Max question from my brother-in-law @davekammeyer who is a pilot, software engineer and deep thinker. The bottom line does not blame software which is the tape support for many other technical and economic forces in force. Remember that the whole point of the 737 MAX project should say that the new aircraft was the same as the old plane. From a technical perspective, the preferred solution was actually to build a new aircraft. But for business reasons, Boeing did not want a "new aircraft" that would require a long certification process and comprehensive (and expensive) new pilot training for its customers. The demand was for an aircraft that was new and not new at the same time. But because the new engines would not fit under the old wings, the new aircraft settled with different aerodynamic properties than the old plane. And because the aerodynamics were different, the flight control systems were also different. But treating it as a fundamentally different plan would have undermined the whole point. So the FAA and Boeing agreed to fudge it. As far as we can see, the 737 MAX is a perfect airworthy aircraft in the sense that flawless piloting makes it possible to operate it safely. But pilots of aircraft that did not collapse held the same basic pattern of behavior suspected of having been behind the two crashes, according to a NASA's Dallas Morning News Review of Voluntary Air Event Reports database. The information in the news reference problems with an autopilot system, and they took place every time during the ascent after start. Many mentioned the plane suddenly nosing down. While records show that these flights took place in October and November, the airlines flying to the pilots were edited from the database. These pilots interrupted all MCAS safely and kept their aircraft in the air. But one of the pilots reported to the database that it was "undeniable that a manufacturer, FAA and airlines would have pilots flying an aircraft without adequate training or even providing available resources and sufficient documentation to understand the very complex systems, that differentiates this aircraft from previous models. " The exercise piece is important because a key sales function at 737 MAX was the idea that pilots should not really be re-trained for the new one as it was not a new aircraft. equipment. As the New York Times reported, "For many new aircraft models, pilots train for hours on giant multimillion-dollar machines, on-site versions of cockpits that mimic the flight experience and teach them new features," while the experienced 737 MAX pilots were allowed refresher courses, as you could do on an iPad. Allowing Boeing to quickly and cheaply bring the aircraft to the customers' hands, but apparently at the expense of increasing the possibility that pilots do not really know how to handle the planes, with serious consequences for everyone involved. In a blockbuster March 17 report to the Seattle Times, the newspaper's space reporter Dominic Gates outlines the extent to which FAA delegated crucial evaluations of 737's security to Boeing itself. The delegation, Gates explains, is in part a story of a one-year process in which the FAA "refers to lack of funding and resources, over the years delegated increased power to Boeing to assume more of the work of certifying the safety of its own aircraft." But there are signs of errors specific to the 737 MAX timeline. Gates reports in particular that "as certification continued, managers led them to speed up the process" and that "when the time was too short for FAA technical staff to conduct a review, sometimes managers either signed on the documents themselves or delegated their review back to Boeing. " Most of all, decisions about what could and could not be delegated could be made by executives worried about the timeline, rather than by the agency's technical experts. It is not clear at this point why the FAA was so determined to get 737 cleared quickly (there will be more investigations), but if you recall the political conditions during this period in Barack Obama's presidency, you can quickly get a general sense of the problem. Boeing is not only a large company with a significant lobbying business in Washington. It is a large production company with a strong global exporting presence and a source of many well-paying professional jobs. In short, it was exactly the kind of business that the powers that were eager to promote – with the Obama White House, for example, would proudly bat for the Export-Import Bank as an important way to sustain the US aviation industry. A story of overwhelming regulators that delay an iconic American company's product launch and cost us good jobs over European competition would have looked very bad. And the fact that the whole plane's purpose was to be more fuel-efficient, made getting it from the ground only a higher priority. But the incentives were really reasonably adapted, and Boeing has only caused problems for itself by cutting corners. A symbol of the whole situation is that when the 737 MAX engineering team piled up cloths at the top of the kludge, it was a cockpit warning that alerted the pilots if the two angle of the planet – attack sensors disagree. But then, as Jon Ostrower reported to Air Current, Boeing's team decided to make the warning light an optional add-on, just as car companies would charge you for a month. The light cost $ 80,000 extra per. Aircraft, and neither Lion Air nor Ethiopian chose to buy it, perhaps that Boeing would not sell an airplane (nor would the FAA allow it), which was not nearly safe to fly. In the wake of the collapse, Boeing has decided to revise this decision and make the light standard on all aircraft. Now, it is clear that Boeing has lost about $ 40 billion in stock market values ​​since the crash, so it's not like cheating the warning light turned out to be a brilliant business decision or something. This is basically one of the reasons why the FAA has worked so closely with Boeing on safety regulations: The nature of the aviation sector is such that there is no real money to sell aircraft that have a poor security pore. One can even imagine outlining a utopian libertarian argument that there is no real need for a government role in certification of new aircraft at all, precisely because there is no reason to believe that it is profitable to make uncertain. Of course, the real world is a bit different than that, and different people and institutions face particular pressures that can cause them to take actions that do not make collective sense. Looking back, Boeing probably wants it just fixed with the plan "build a new aircraft" and set it for a couple of years of gross sales rather than ending up in the current situation. Right now they are actually trying to patch things up – a software update here, a new warning light there, etc. – hoping to persuade the global regulatory agencies to let their aircraft fly again. But even when it is done, they face the task of convincing airlines to actually buy their aircraft. An informative David Ljunggren article for Reuters reminds us that a somewhat comparable situation arose in 1965, when three such new Boeing 727 jetliners crashed. There was not really anything unhealthy about the 727 aircraft, but many pilots did not fully understand how the new flaps should be operated – possibly a parallel to the MCAS situation with 737 MAX – which encouraged some extra training and changed to the operating manual . Passengers avoided the planes for several months, but eventually returned as there were no more crashes, and 727 continued to fly safely for decades. Boeing hopes to have a similar happy ending to this story, but so far they seem to be far from that point. And their immediate future is likely to pose more difficult questions. 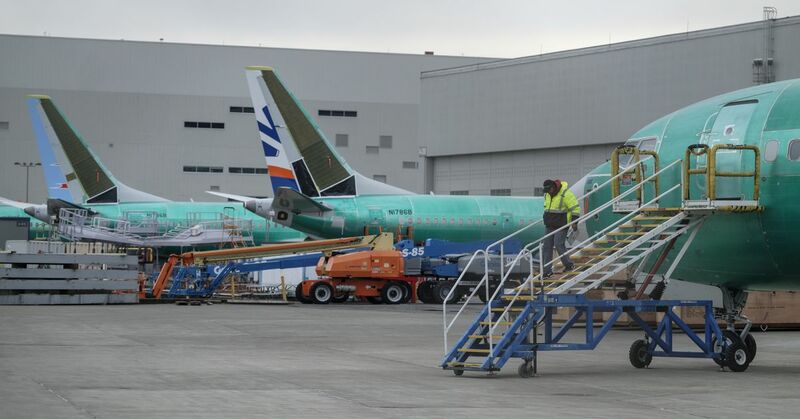 737 MAX was briefly a matter of political controversy in the United States when foreign regulators founded the aircraft, but President Donald Trump – after speaking personally to Boeing's CEO – refused to follow. Many members of the Congress (from both parties) urged him to rethink, which he did very quickly, and pushed the whole issue out of Washington's burner. But Trump is generally friendly to Boeing (he even has a Boeing executive as acting defense secretary despite an ongoing ethics investigation of charges that he unfairly favors his former employer), and the Republicans are generally resilient to tough legislative violations . The most important decisions in the mix seem to have been made back during the Obama administration, so it is also difficult for the Democrats to go after this problem. Meanwhile, Washington has been involved in shaking over Specialist Robert Mueller's investigation and a new health battlefield also opened. Then, on March 27, said the FAA's officials were facing the Senate Commerce Committee's Aviation and Space Subcommittees during a hearing convened by Ted Cruz (R-TX) subcommittee chairman. Cruz says he expects to call another hearing with Boeing's leaders, as well as pilots and other industry players. Cruz was the leader in the anti-Boeing side of the Export-Import Bank fight many years ago, so it might be more enjoyable than others in Congress to go on. However, when the political system begins to engage in the issue, it is unlikely to stop with only one congress subcommittee. Billions of dollars are at stake for Boeing, the 737s airlines, and the aircraft builders. And since a key element of this story is the credibility of the FAA's own process – both in the eyes of the American people and also in the eyes of foreign regulators – it will hardly be sorted without the involvement of the actual decision-makers in the US government.